Our practice was founded in 1894 by Dr. Thomas Bell and has grown over 120 years into a multi-doctor practice serving visually impaired patients at four major centers. Our doctors have received over 43 state and national awards. We are the only practice in history to twice receive the Optometrist of the Year Award for the United States in 1984 ( the late Dr. R. Lewis Scott) and in 1999 (Dr. Richard Windsor) from the American Optometric Association. 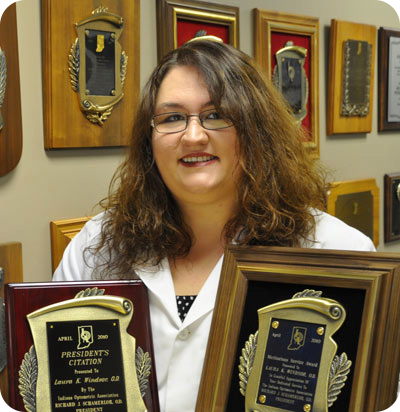 Dr. Laura Windsor was awarded the National Young Optometrist of the Year Award by the American Optometric Association in 2011. Click the links below to learn more about each of our doctors. Craig A. Ford, O.D., F.A.A.O.